Helen Lederer has been making us laugh for years, from stand-up comedy, to Absolutely Fabulous, to her debut novel Losing It, published in 2015. 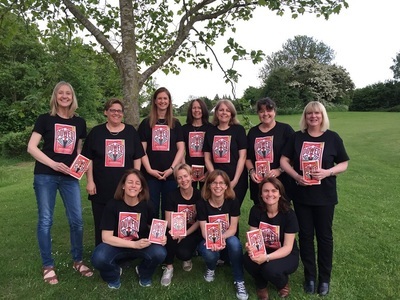 She’s now turning her sights on supporting other female comic writers, with the creation of the Comedy Women in Print prize, open to both published and unpublished female writers. We caught up with Helen in an exclusive interview about her love of reading and writing. What is the book that first inspired your love of reading? What is your top comedy book recommendation? Do you think that it’s important for people to share their reading experience, for example by being in a reading group? Yes I do, it’s a real connector of the universal experience. I’ve never been part of a reading group but it’s something I’d love to do now. What role has reading played in your life and writing? I loved reading as a child – Enid Blyton was a rather big bias at one stage (the crush I had on Darrel Rivers in Malory Towers was second to none). To disappear into a private literary world, where something else has already done the dreaming for you, suited me perfectly. I loved our library and was always excited about which book would come home with me. In front of a great big PC. I got a lentil caught on my number six the other day and it got stuck so I couldn’t get my password to work. What inspired you to create this prize? I’d just finishing my novel Losing It and heard, rather amazingly, that I’d been nominated for the Bollinger Everyman Wodehouse Prize for Comic Fiction. I started investigating other prizes for female comedy fiction and realised that none existed. I channelled some of the latent anger I had left over from the 1980s when I began as a female stand-up in a climate where women were seen as ‘alarming’ if they purported to be funny – I wanted to address some of that past anger and affect parity in the landscape of literary prizes! With the prize open to both published and unpublished novels, do you have any advice for aspiring comic female novelists? I would start with finding an authentic narrative voice, be it in the first- or third-person. Once the reader connects and believes in the tone of the prose, the laughs will follow. ‘Try hard’ is a killer for comedy, but one person’s version of ‘try hard’ is another person’s punchline, which is very far-reaching and varied, it’s such an excited and controversial landscape. What is the definition of love in a lorry? Submissions for the CWIP prize are open until February 28 2019. The winning unpublished female writer will receive a publishing contract with HarperFiction and a £5,000 advance. The runner-up will be awarded a free place on the University of Hertfordshire’s MA in Creative Writing. The winning published female writer will receive a cash prize of £2,000.